This quilt pattern was designed and entered into a quilt challenge by Donna House’s high school friend, Christine Kinley of Cogan Station Pennsylvania. Christine became the proprietor of a needle workshop called Country Stichery. This quilt pattern is a strip-pieced design in Amish colors, and is based on the spider web block. Christine was inspired by the vibrant solid Amish colors combined with the black color. This particular pattern was published in a popular quilt magazine, which Donna has an autographed copy; and it is a special keepsake for her. Sadly Christine passed away at a young age. 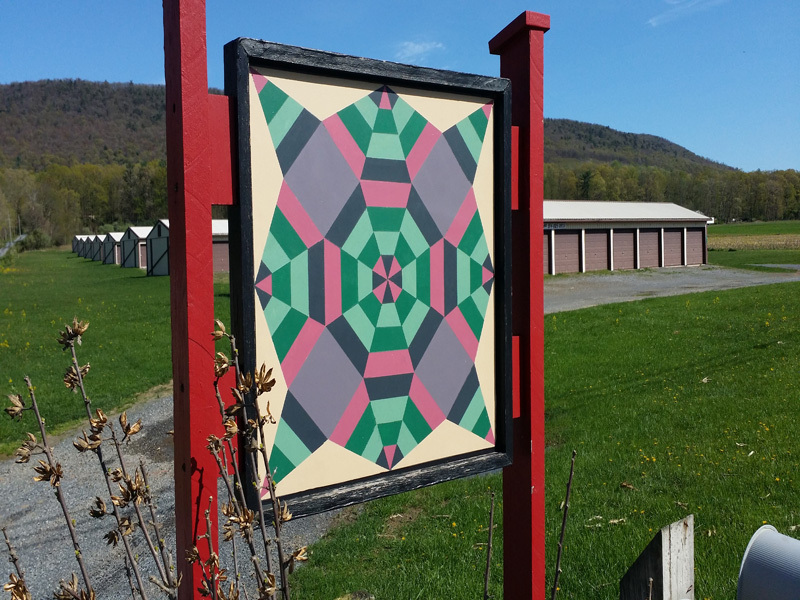 Angie Shaffer, Donna’s daughter, urged her mother to honor the memory of her friend by having the Amish Kaleidoscope pattern made into a Barn Quilt and display it at the end of her lane by the mailboxes. With the assistance of Tom Duffey and Mike Crampton, preparing the board; Linda Garber, painting the quilt design; and Johnnie Greathead, installing the quilt board; Donna has honored the memory and handiwork of her beloved friend, Christine.